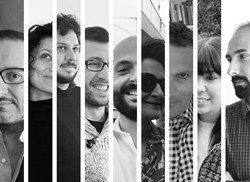 NUOVOSTUDIO born in Ravenna in 2000 through the work of its founders Gianluca Bonini and Emilio Rambelli, recently joined by Giovanni Mecozzi, who coordinates the activities of Grazia Poli, Francesca Ancarani and Carmen Minafra and collaborators Angelo Ciccolo, Andrea Guardigli and Fausto Bruno. The professional activity of the office, moving from urban planning to interior design, has received many awards, including: the publication of “Casa AG”, “Casa Ruggini” and “Palazzo Degli Affari”, in Ravenna, on “Almanacco dell’Architettura Italiana” by “Casabella” (in 2001, in 2006 and in 2008). In 2012, the acknowledgement of “Lercaro Modern Art Gallery” in Bologna by the Institute of Cultural Heritage of Emilia Romagna. This architectural work was considered among the top ten built in the district between 2000 and 2010; The selection of “Tozzi Industries Headquarter” in Ravenna and “Giuseppe Zanotti Boutique” in London among the finalists of "The Plan Award 2014" and, also in 2014, the prize IQU for the refurbishment project of the “SIR Warehouse” in the Ravenna’s dock. Concerning the competitions experience, NUOVOSTUDIO took part in many international competitions and achieved some awards: two first prizes and several reports and certificates of merit. Since 2011 NUOVOSTUDIO is present on the web platform World-Architects.com, a website in charge of selecting and presenting the main architectural worldwide firms. The NUOVOSTUDIO’s work is appeared as a topic of discussion on several publications and online magazines in the field.